According to the American Diabetes Association and the American College of Sports Medicine, 58% of American adults are physically active, whereas only 39% of adults with type 2 diabetes are physically active. However, there is no shortage of evidence indicating that diet and exercise are crucial for the management of type 2 diabetes. In fact, the 2010 guidelines issued by the American Diabetes Association (ADA) and the American College of Sports Medicine (ACSM) recommend that patients with type 2 diabetes engage in at least 150 minutes per week of moderate to vigorous aerobic exercise. This exercise should be spread out over at least 3 days per week, occurring on no more than 2 consecutive days. Compared to their 2000 recommendations, the new 2010 recommendations consider the needs of those individuals with type 2 diabetes who are limited in their ability to engage in vigorous exercise. In addition to weight loss, improved insulin sensitivity, disease management, and overall improved health, there are many reasons from a cellular biology perspective for individuals with type 2 diabetes to incorporate exercise into their daily routine. This page will explore general exercise recommendations, response to exercise in individuals with type 2 diabetes, and the effects of exercise from a cellular biology perspective in order to help identify appropriate exercise recommendations for individuals with type 2 diabetes. Figure 1. 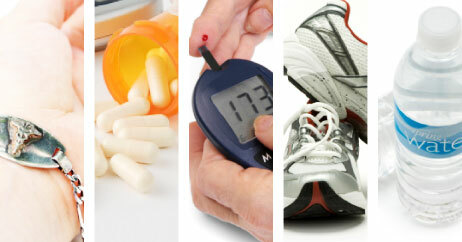 Managing type 2 diabetes requires a combination of diet, exercise, and medication (when prescribed). Evidence is mounting that links participation in regular exercise, in addition to other lifestyle modifications, with improved glucose control and prevention of type 2 diabetes. However, there is a lack of studies specifically focused on determining the sole effects of exercise on the risk of type 2 diabetes. A review of epidemiological studies by Hu et al reported risk reductions for type 2 diabetes across multiple populations ranging from 15% to 60% with performance of regular physical activity. Additionally, a review of large diabetes prevention trials by Sanz et al reported that interventions focused on increasing exercise along with diet can cut the incidence of type 2 diabetes in half for adults with impaired glucose tolerance. This review also showed that the reduction in incidence from such interventions carried over for years after cessation of supervised activity. Furthermore, a systematic review and meta-analysis by Gillies et al reported that lifestyle interventions focusing on achieving weight loss as well as increasing physical activity are just as effective as pharmacotherapy for reducing the risk of type 2 diabetes in individuals with impaired glucose tolerance. Epidemiological research has stressed the importance of leisure-time activity levels. In Finland, a large diabetes prevention trial found that people who greatly increased leisure-time physical activity (i.e. >3 hours per week) had more than 70% risk reduction for diabetes compared to those who failed to do this. 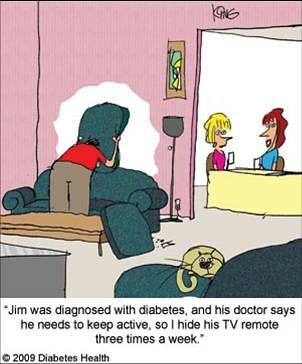 The amount of television individuals watch each day also appears to be linked to risk of type 2 diabetes. Research has suggested that with each additional 2-hour period of watching television per day, risk of type 2 diabetes increases 14%-20% in adults. To date, no well-designed studies have reported the effects of exercise on risk of type 2 diabetes for children and/or adolescents. However, considering the increasing prevalence in this population, it is logical that risk reduction interventions in youth should aim to increase physical activity and decrease screen time (e.g. TV, video games, computer). Figure 2. Increasing physical activity during leisure time may decrease risk of developing type 2 diabetes. Multiple reports have clearly demonstrated the importance of exercise in the prevention or delay of type 2 diabetes. Collectively, a majority of the studies support the joint recommendation set forth by the ACSM and the ADA, suggesting that individuals can reduce risk of type 2 diabetes by participating in 150 minutes of moderate to vigorous physical activity per week.,,,,,,,, Previous studies also appear to support this recommendation for both males and females, as well as across ethnic groups. However, this “one size fits all” approach has been challenged with preliminary evidence of a dose-response relationship between physical activity and risk reduction. Obesity is one of the largest risk factors associated with development of type 2 diabetes., It has been suggested that the ACSM’s and the ADA’s recommendations may not be sufficient to prevent obesity or assist in weight loss for individuals who are obese or overweight. Thus, it has been proposed that such high-risk individuals could attain greater risk reduction with greater amounts of physical activity (e.g. 300 minutes of moderate intensity physical activity per week; 120-150 minutes of high intensity physical activity per week). Furthermore, this notion is supported by work from previous diabetes prevention trials, which have shown greater risk reduction in treatments that induce weight loss.,,,, However, many of these trials also included dietary interventions along with exercise, and further research is warranted to exclusively determine effects of higher exercise volume on risk reduction. A systematic review of prospective cohort studies by Jeon et al reports that individuals who regularly participated in moderate intensity physical activity reduced risk of type 2 diabetes by 30% in comparison to sedentary individuals. In the study, physical activity was considered moderate intensity if it required a metabolic equivalent task (MET) score ranging from 3.0 to 6.0. Activities at this intensity level include aerobics, such as walking at 3.5 miles per hour and cycling at 10 miles per hour; as well as leisure-time activities, such as golfing, gardening, and home repair. Furthermore, when data was accounted for body mass index, results remained significant; with a 17% risk reduction associated with moderate intensity physical activity. Such results indicate risk reduction may be achieved by performance of moderate level physical activity, even in the absence of weight loss. Most studies related to prevention and risk reduction of type 2 diabetes have analyzed the effects of aerobic activity; with decreased risk of disease associated with factors such as weight loss, as well as improved insulin function, glucose control, and physical fitness.,,, To date, no studies have assessed effects of only resistance exercise on the risk of developing type 2 diabetes. However, resistance training has been shown to stimulate insulin sensitivity via similar cellular mechanisms to aerobic training (i.e. increased expression of Glut4, increased production of glycogen synthase). It is important to note that research has found that these effects are less profound with resistance exercise in comparison to aerobic exercise. Nonetheless, it has been suggested that resistance exercise in combination with aerobic exercise may provide greater benefit for high-risk individuals., For example, a review by Burr et al recommends that in addition to structured aerobic exercise, patients with prediabetes should also engage in resistance training 2-3 days per week, consisting of 6-8 exercises that target all major muscle groups (i.e. 3 sets x 8-10 reps each exercise; resistance approximately 75% one-rep maximum). However, more high-quality research is required to further clarify the specific exercise parameters (i.e. type, combinations, duration, intensity) that are best for reducing the risk of type 2 diabetes. Research has found that a temporary physiological increase in reactive oxygen species (ROS) may be essential for a training-induced increase in insulin sensitivity in patients with type 2 diabetes. ROS are beneficial when the increase in ROS is temporary. However, ROS are harmful when the increased concentration is continuous. 13 obese type 2 diabetic subjects and 14 obese control subjects participated in 10 weeks of aerobic training, which consisted of cycling on a stationary bicycle 4-5 times per week, for 20-35 minutes per session, at an average exercise intensity of 65% maximal oxygen consumption (VO2 peak). Subjects were instructed not to make any dietary changes throughout the 10 weeks of training. At the completion of the 10 week training period, both the obese patients with type 2 diabetes and the obese control subjects exhibited a significant increase in rate of glucose disposal, which indicated an increase in insulin sensitivity. Pre-training, the subjects with type 2 diabetes were found to have higher levels of ROS compared to the obese controls. However, 10 weeks of aerobic training decreased levels of ROS in both groups of participants. Training also significantly increased mitochondrial respiratory capacity when determined per muscle weight in the subjects with type 2 diabetes. An animal study with 24 male diabetic ZDF (fa/fa) rats and 8 lean ZDF rats compared the effects of a single bout of exercise (acute exercise) with exercise training (chronic exercise) on lipid and glucose metabolism and the inflammatory response in ZDF rats. The diabetic ZDF (fa/fa) rats were randomly assigned into either the sedentary or the exercise group. The exercise rats initially swam 15 mins/day, 5 days/week. The intervention was then gradually increased by increments of 15 mins/day until the rats were swimming 1 hour/day. Once this intensity was achieved, the exercise rats swam 1hour/day, 3 days/week, for the duration of the 12 week intervention. After the 12 week exercise period was complete, the sedentary rats were split into two groups. One group was then forced to swim until exhaustion, which comprised the acute bout of exercise. At the completion of the 12 week intervention, the exercise rats that participated in chronic swim training demonstrated significantly lower levels of cholesterol and triglycerides, when compared to the sedentary group. On the other hand, the acute bout of exercise had no effect on cholesterol or triglyceride levels. Both the acute and chronic exercised ZDF rats demonstrated decreased glucose levels compared to the sedentary ZDF rats. The chronic exercise ZDF rats showed significantly decreased HbA1c levels; however, the acute exercise did not affect HbA1c levels in the ZDF rats. A significant decrease in insulin resistance was demonstrated in both acute and chronic exercise rats; however, the reduction was more apparent in the acute exercise ZDF rats than the chronic exercise ZDF rats. In addition to the above effects, chronic swim training in the ZDF rats reduced the inflammatory response and decreased serum levels of TNF-α to those found in sedentary lean control rats. In sum, the obese ZDF rats in the acute exercise group demonstrated decreased glucose levels and decreased insulin resistance. However, no change in cholesterol or triglyceride levels were evident post-acute exercise. In contrast, the chronic exercise produced a delay in the development of type 2 diabetes and a partial correction of hyperinsulinemia in the ZDF rats. The authors conclude that aerobic exercise training enhanced the lipid profile of the chronic trained ZDF rats by decreasing the cholesterol and triglyceride levels. Figure 3. Moderate physical activity increases both nitric oxide (NO) and ROS and decreases oxidative stress. However, strenuous exercise increases NO, markedly increases ROS, and increases oxidative stress. Glycated hemoglobin (HbA1c) is widely considered one of the best biological markers for glucose control., Due to this, many studies reporting the effects of exercise interventions on type 2 diabetes often use HbA1c as either a primary or secondary outcome measure. It is important to recognize that in humans, HbA1c levels reflect an average of plasma glucose concentrations from the previous 3-4 months. Therefore, changes in HbA1c levels occur over long periods of time, and are not likely to be affected by single bouts of exercise. Exercise-induced changes in HbA1c levels are more likely to occur with participation in exercise for 3-4 months or longer. In regards to exercise parameters, research has shown programs consisting of greater than 150 minutes of exercise per week have greater reductions in HbA1c compared to programs consisting of 150 minutes of exercise or less, regardless of exercise modality. However, research has suggested that exercise intensity may play a more important role in reducing HbA1c levels in comparison to exercise duration. For example, a review of type 2 diabetes exercise studies by Zanuso et al reports that interventions consisting of higher intensity aerobic activities (e.g. 75%-85% VO2max) produce greater reductions in HbA1c, as opposed to lower intensity activities. Overall, it appears that chronic adherence to the recommendations set forth by ACSM and the ADA (i.e. >150 minutes of moderate to vigorous exercise per week, with exercise bouts spread out at least 3 days per week) will result in reductions in HbA1c.,,, Nonetheless, further high-quality studies are required to determine the best parameters of exercise to induce such changes in HbA1c. Multiple animal studies have also supported the notion that exercise can reduce HbA1c levels. This has been found across multiple trials using both different animal models of type 2 diabetes, as well as different exercise interventions. For example, it has been found that Zucker diabetic fatty (ZDF) rats that engage in chronic swimming interventions have significant reductions in HbA1c levels in comparison to sedentary controls.,,, In each of these studies, ZDF exercise rats initially swam 15 minutes per day for 5 days per week; eventually building up to 1 hour per day, performed 3 days per week for a period of 12-13 weeks.,,, Among these ZDF rat exercise studies, reduction in HbA1 was found in addition to decreases in TNF-α, as well as decreases in markers of oxidative stress., Therefore, it appears that exercise-induced improvements in glucose control can occur in ZDF rats without exacerbating the effects of inflammation or oxidative stress., In addition, research has also found that Otsuka Long-Evans Tokushima Fatty (OLETF) rats that perform voluntary daily running on wheel have significantly lower HbA1c levels in comparison to sedentary controls., In addition to decreased HbA1c, evidence also suggests that daily wheel running can increase expression of mitochondrial markers in visceral fat tissue of OLETF rats. It is possible that such factors may play a role in prevention of insulin resistance in type 2 diabetes. 8 patients with type 2 diabetes (means: age 63 years, BMI 32 kg/m2, HbA1C 6.9) participated in a low volume high-intensity training (HIT) program over a 2 week period. There were six sessions total, each consisting of 10x60s cycling bouts that elicited approximately 90% max HR with 60s rests interspersed. Glut4 protein was measured before and after the intervention using muscle biopsies of the vastus lateralis. Continuous glucose monitoring (CGM) was performed 24 from hours before to 24 hours after the intervention to measure effects on glycemic control. CGM has been shown to provide sensitive information regarding direction, magnitude, and frequency changes in blood glucose and acute changes in daily blood glucose. All participants attended each of the six sessions. Post training mean Glut4 levels were 369% higher compared to baseline (P=.003). Post training CGM was significantly lower in concentrations and postprandial areas under glucose curves compared to baseline, demonstrating a greater glycemic control. The authors concluded that the low volume HIT intervention (a 75 min commitment per week) significantly improved Glut4 levels and glycemic control parameters. These findings coincide with diabetic animal studies that showed exercise-induced increases in Glut4 contribute to improved glucose uptake and glycemic regulation, even in the face of insulin resistance. 7 obese subjects with type 2 diabetes (fasting glucose > 7/mmol) participated in a 4-week exercise intervention with continuous and high intensity intermittent sessions. They were compared to an age and BMI matched non-diabetic control. Glut4 was measured in skeletal muscle and adipose tissue before and after an exercise intervention. Exercise training consisted of on cycle ergometry consisting of 3 days per week continuous modrate intensity (60 minutes at 55% Wmax) and 2 days per week intermittent high intensity ( 6 x 5 minute bouts at 70% Wmax) with supervision. Baseline Glut4 expression in adipose was significantly lower (43%, P<.05) in the diabetic group compared to control. There were no differences baseline Glut4 within muscle. Post intervention Glut4 expression in muscle and adipose increased significantly (36% and 20%, P<.05 each) compared to pre-exercise levels and were significantly higher than control (P<.05). The authors conclude that Glut4 adaptations are evident in both tissue with exercise training, although the adipose tissue changes have limited functional benefit in diabetic patients with no beta cell function for producing insulin, since it is the tissue’s only mode of glucose absorption. These studies coincide insofar as exercise in acute and chronic exposures promotes increased Glut4 expression in skeletal muscle in diabetic patients. However, the degree of this expression can be disputed, as some studies show far greater changes than others (369% versus 36%). Further research is needed to examine the various interactions between fitness and Glut4 expression and the effects of the various exercise interventions available. A recent study was conducted to examine how the TNFα system changes after exercise and its relationship with insulin sensitivity. Subjects included 16 sedentary women (age 30-50 years, BMI >27.8 kg/m2), 8 of which had impaired glucose tolerance (IGT) and 8 with normal glucose tolerance (NGT). Glucose tolerance was determined by the results of an oral glucose tolerance test. Subjects diagnosed with diabetes were excluded. A control group was used that included 8 healthy (BMI<25 kg/m2) age matched subjects with normal glucose tolerance that were measured at baseline. Prior to the intervention and after 12 weeks anthropometric measurement and blood tests were done to assess TNFα system activity by measuring sTNFR1 and sTNFR2 (TNFα system receptors found in humans) and insulin sensitivity. The 16 sedentary subjects completed 12 weeks of exercise on a bicycle at 70% max heart rate. Exercise was done for 5 days a week, 30 minutes each day. Results: At baseline and after 12 weeks of intervention the anthropometric measures were similar in the NGT and IGT groups. Initially, the IGT group showed higher fasting blood glucose, insulin, free fatty acids (FFA) and HbA1c compared to the NGT and control group. Initially, both obese groups had higher TNFα and sTNR2 compared to the control, and the IGT group was significantly higher than the NGT group. sTNFR1 levels were similar in all 3 groups at baseline. Following the exercise intervention, there were significant decreases in BMI, waist circumference, HbA1c, FFA, and percentage of body fat in both the IGT and NGT groups. The levels of TNFα and sTNFR2 were reduced significantly after 12 weeks of exercise, but the sTNFR1 did not change. The IGT group had much greater decreases in TNFR2 than the NGT. Therefore, the authors noted that decreased sTNFR2 levels coincided with decreased waist circumference and increased insulin sensitivity. Based on these results, regular endurance exercise was shown to decrease TNFα activity that was also linked with an increase in insulin sensitivity in both NGT and IGT subjects; however a greater increase in insulin sensitivity was observed in subjects with impaired glucose tolerance. A randomized controlled trial examined different exercise durations and intensities and their effect on weight-loss in sedentary overweight women. 201 subjects were between 21 and 45 years old with a BMI of 27 to 40 and they reported exercising less than 3 days/week for less than 20 minutes/day for the prior 6 months. Exclusion criteria included: history of myocardial infarction, medication that is known to alter heart rate response to exercise or metabolism or weight loss, treatment for psychologic conditions, pregnant or recent pregnancy, planning a pregnancy, a medical condition that may affect metabolism or body weight or that would hinder participation in exercise. Intervention included group meetings and phone calls, calorie and fat intake restrictions. Subjects were to keep food logs and given meal plans. There were 4 different exercise groups assigned based on energy expenditure of 1000 kcal/wk or 2000 kcal/wk and exercise intensity (vigorous or moderate) based on age-predicted maximal heart rate. The 4 groups were: vigorous intensity/high duration, moderate intensity/high duration, moderate intensity/moderate duration, and vigorous intensity/moderate duration. Each group started at the moderate intensity and duration consisting of walking 100 minutes/week. Body weight and cardiorespiratory fitness were measured after 6 and 12 months of exercise. After 1 year, mean weight loss was 19.6 (vigorous intensity/high duration), 18.04 (moderate intensity/high duration), 13.9 (moderate intensity/moderate duration) and 15.4 (vigorous intensity/moderate duration) pounds. Cardiorespiratory fitness increased by 22%, 14.9%, 13.5% and 18.9% respectively. The authors concluded that there were no significant differences of exercise duration or intensity on changes in body weight. The authors divided the groups into those that exercised >/= 200 minutes/week and those that exercised <150 minutes/week and found that the >/= 200 minutes/week group lost more weight and had more improvement in cardiorespiratoory fitness. Therefore, to achieve weight loss, duration of exercise of at least 150 minutes/week of walking was more important than moderate versus vigorous intensity. A recent study included 40 obese boys with a mean age of 11 and a BMI of at least 30 kg/m2. The following measurements were taken at baseline and after 12 weeks: total cholesterol, high-density lipoproteins (HDL), LDL, very-low denstiy lipoproteins (VLDL), triglycerides, insulin levels, height, weight and BMI. Circumference measures included: bilateral forearms, elbows, calves, knees, waist, chest and hip. Skinfold measurements included: biceps, triceps, chest, subscapula, calf, abdomen, suprailiac and leg. Subjects were randomly assigned to either an exercise or non-exercise group. The exercise group completed 12 weeks of 20-45 minute exercise sessions (walking or jogging), 3 days per week with a target heart rate of 60-65% max based on their age. The non-exercise group was informed not to change their current levels of exercise. The exercise group experienced significant changes compared to the control group in the following: LDL, HDL, VLDL, triglyceride, total cholesterol, skinfolds of calf, chest, subscapula, suprailiac, abdomen and leg, circumference of the elbow, elbow, knee, calf, waist, hip and chest. Improvements were also observed in weight, BMI and insluin levels in the exercise group, however they were deemed not significant changes. The exercise group lost an average of 6.15kg where as the control group gained 0.5kg on average. The BMI of the exercise group decreased by an average of 6.18 kg/m2 where as the control group’s BMI increased by 1.8 kg/m2 on average. Lastly, insluin levels in the exercise group decreased from 37.1 to 31.5 mU/mL while the non-exercise group increased from 39.6 to 41.7 mU/mL. Based on this research, regular exercise is effective at maintaining and decreasing weight and reversing obesity in children. Exercise also had positive effects on cholesterol levels, thereby reducing cardiovascular disease risk factors. Exercise along with healthy eating habits has positive effects on overall health and can help to reverse the epidemic of childhood obesity and diabetes. Research shows increased AMPK muscle activity, caused by exercise, leads to increased PGC-1α activity in healthy subjects. Many studies have shown that obese insulin-resistant rats have irregular activation of AMPK. Research on patients with type 2 diabetes and a BMI between 26 and 29 kg/m2 has shown normal AMPK muscle activity. However, patients with type 2 diabetes often have a BMI greater than 30 kg/m2. A recent study was designed to figure out if there is evidence of decreased AMPK activity in patients with type 2 diabetes with moderate-to-severe obesity (BMI greater than 30 kg/m2). The study included 12 obese subjects with type 2 diabetes, 8 obese nondiabetic subjects, and 8 lean nondiabetic subjects. Each of the subjects was sedentary (zero to one exercise session per week) and had low fitness levels. Each subject participated in two separate exercise tests, with 4-6 weeks between the sessions. One of the exercise sessions was done at low (50% VO2max) and the other at moderate (70% VO2max) intensity, with each session lasting 40 minutes. Subjects were required to do an overnight fast prior to the exercise testing. Muscle biopsies were taken from the vastus lateralis muscle prior to exercise as well as after 6, 10 and 40 minutes of exercise and lastly 150 minutes after exercise. Muscle biopsies were analyzed for AMPK and LKB1 activity. The subjects were matched based on age, VO2max, and workload and the type 2 diabetic and nondiabetic obese groups were matched based on BMI. Baseline muscle biopsies had no between group significant differences in AMPK content. AMPK activity did not significantly increase in any of the groups at low intensity exercise. Moderate intensity exercise significantly increased AMPK activity in the lean subjects, but there were no significant differences observed in the type 2 diabetic and obese groups. Although moderate intensity exercise was shown to increase AMPK activity in the obese and type 2 diabetic subjects, it was not a significant increase. Therefore, the authors suggest that obese type 2 diabetic patients possibly need to exercise at a higher intensity, than used in this study, in order to increase AMPK activity to similar levels as lean nondiabetic subjects. Research has demonstrated that AMPK activation is decreased in healthy female subjects compared to healthy males. This article had more female subjects in the obese and type 2 groups and therefore it could not be concluded that female patients had decreased AMPK activity based on this article, even though the subgroup analysis showed decreased AMPK activity in females. The obese Zucker rats lost 7% of their body weight during the training program and there was a 120% increase in the insulin-stimulated glucose uptake in the obese insulin-resistant rats. Following 7 weeks of treadmill training, no change in AMPK phosphorylation was noted in the obese insulin-resistant rats. LKB1 protein content increased by 2.8 times the baseline amount in the obese insulin-resistant trained rats. The increase in LKB1 content is significant because it has been shown to correlate with increased PGC-1α content. In conclusion, this research shows that obese insulin-resistant Zucker rats have less LKB1 muscle content and that it can be increased with exercise. In this particular study AMPK phosphorylation did not increase following exercise training, but PGC-1α expression did increase, which would mean that PGC-1α content can increase without increases in AMPK activity. However, the authors noted that AMPK activity returns to baseline after 30 minutes of exercise and in this study the muscle biopsies were not taken until 24 hours after exercise. Therefore, it is likely that the increased PGC-1α expression was due to consistent increases in AMPK activity with chronic exercise. An article examined the effect of resistance training on AMPK activity. The experimental group included 10 subjects that had type 2 diabetes with a mean age of 61 years and a BMI of 28.3kg/m2. The control group consisted of 7 healthy subjects with a mean age of 62 years and a BMI of 24.5 kg/m2. Vastus lateralis muscle biopsies of both legs were taken at baseline and 16 to 18 hours after the final session following an overnight fast. Training included 6 weeks of resistance training on one leg only. Supervised sessions were three times per week for 30 minutes. Intensity was based on the subject’s 1 repetition maximum (1RM). The first 2 weeks consisted of 3 sets of 10 at 50% 1RM. The next 2 weeks consisted of 4 sets of 8 to 12 reps at 70-80% 1 RM. The last 2 weeks the resistance was increased in order to have each of the 3 sets end in failure. Muscle biopsies revealed normal AMPK activity following resistance training in the subjects with type 2 diabetes. Therefore, resistance training is an effective intervention to increase AMPK activity in patients with type 2 diabetes. PGC-1α is a transcription co-activator involved in mitochondrial biogenesis, oxidative phosphoralation, increasing Glut4, increasing angiogenesis and muscular fiber type transformation. A study investigating the effects of high intensity low volume interval training found that two weeks of interval training of 60 seconds of cycle ergometry at their peak power with rest periods of 75 seconds at 30 watts. Over the two week training period, the subjects increased the amount of intervals from 8 to 12 per session. The total duration of the session lasted between 20-29 minutes with 3 minute warm up. Results of this intervention found an increase in PGC-1α content in the nucleus, yet no change in overall cellular PGC-1α content. Little et al. suggested that even though there was no significant increase in overall cellular content, the location of the PGC-1α is more important and that having PGC-1α in the nucleus of the cell is more beneficial for mitochondrial biogenesis. These finding were also supported by increases in Tfam, the protein involved in mitochondrial gene replication, and mitochondrial enzymes involved in the electron transport chain: cytochrome c oxidase, cytochrome c oxidase II, cytochrome c oxidase IV, and citrate synthase (an enzyme involved in the Krebs cycle). In a study investigating the effects of exercise on young type 2 diabetic average age 23 subjects compared to control subjects without type 2 diabetes with similar age, weight, and gender ratio. The study investigated acute and chronic exercise changes. The chronic group exercise for 70 minutes (5 minute warm up, 60 minutes exercise, 5 min cool down) 4 times a week at 70% VO2 max for 12 weeks. The acute exercise group performed the same exercise for 7 consecutive days. Both groups had muscle biopsies performed at pre-test and after their final exercise session. Results for the chronic exercising group found the young type 2 diabetic group had no change in VO2, insulin sensitivity, insignificant drop in plasma free fatty acid for the chronic group where as the non diabetic group had a 20% increase in VO2, and a significant drop in plasma free fatty acids. The acute exercise study also found a 4x increase in PGC-1α in the control group compared to no increase in PGC-1α in the young type 2 diabetic group. In the chronic exercise study there was an increase in encoding genes for PGC-1α for the control group and no changes with the diabetic group. This study suggest that young type 2 diabetics do not respond to exercise and have exercise related changes compared to subject of similar age and weight who are not insulin resistant. Figure 6. Research has found that high intensity training leads to increased levels of PGC-1α, which results in an increase in the following:type 1 muscle fibers, mitochondrial biogenesis, fat oxidative capacity, GLUT4, and glycogen. 18 male subjects with type 2 diabetes and 20 healthy male control subjects participated in a 12 week exercise training program, which consisted cycling on an ergometer twice a week for 30 minutes at 55% of a predetermined maximal workload. At the end of the 12 weeks, the experimental group demonstrated increased IMCL content compared to the control group. This increase was explained by a near-significant increase in IMCL in the experimental group subjects’ type 2 muscle fibers. Exercise training also restored mitochondrial function in the individuals with type 2 diabetes to values near those found in the control subjects after training. The return of mitochondrial function was combined with 1) improved insulin-stimulated glucose disposal and 2) the restoration of metabolic flexibility and insulin-stimulated substrate oxidation near the control groups’ values. Both results were coupled with a near-significant increase in IMCL content. Training-induced increases in IMCL content may be caused by improved distribution of fatty acids in IMCL due to exercise-induced increases in DGAT1 (the rate-limiting enzyme in IMCL synthesis). In fact, increasing IMCL storage capacity by the over-expression of DGAT1 was found to improve insulin sensitivity. The two major determinants of myocellular insulin sensitivity are 1) appropriate mitochondrial function and 2) the ability to store fatty acids as IMCL. Overall, this research suggests that exercise training in patients with type 2 diabetes improves mitochondrial content. It also results in adaptive responses within the mitochondria in order to better manage the myocellular metabolic stress that occurs in the insulin-resistant state. Evidence suggests that adding exercise to a weight loss intervention might not improve insulin resistance more than the weight loss intervention would alone. Therefore, a study was conducted to analyze how mitochondrial capacity reacts to diet-induced weight loss in individuals with insulin resistance compared to an intervention comprised of weight loss and moderate exercise. Insulin resistant subjects were randomly assigned to either the diet group or the diet plus exercise group. The diet-only group met with a dietician for nutritional instructions throughout a 16 week period. The diet plus exercise group was instructed to walk on a treadmill 3-5 days/week for 16 weeks at 60-70% of their maximal heart rate. The participants began exercising at 30 minutes/session for the first month and increased to 40 minutes/session in the second month. At the end of the 16 weeks, both groups demonstrated increased fasting insulin concentrations and increased insulin-stimulated glucose disposal. Only the diet plus exercise group significantly changed aerobic capacity (VO2 max). However, despite demonstrating improved aerobic capacity, the addition of moderate-intensity exercise did not improve insulin resistance in the diet plus exercise group. In response to the diet plus exercise intervention, IMCL levels did not change but mitochondrial density increased. In contrast, in response to the diet-only intervention, IMCL levels significantly decreased but mitochondrial density did not change. Overall, the authors indicate that moderate weight loss, although combined with decreased IMCL and improved insulin resistance, does not increase mitochondrial content or mitochondrial function in obese, insulin-resistant adults. 48 male Wiskar rats were divided into three groups: control, STZ-induced diabetes with no exercise (DM), and STZ-induced diabetic with moderate exercise (DM-ex), to evaluate the effects of regular moderate exercise on cardiac survival pathways. The exercise rats were trained on a motor driven treadmill for 10 weeks, 5x per week, starting at a speed of 12m/min for a duration of 20 min the first day. The time was extended by 10 min per day until 60 min was reached. The speed was increased by 3m/min every 2 weeks until 27m/min was reached. TUNEL apoptosis cells, pro-survival Bcl-2 family proteins, and caspase-3 expression in cardiac tissue were measured before and after the intervention using histopathological analysis, positive TUNEL assays and Western blotting. The DM group had significantly greater TUNEL apoptosis compared to control and exercise groups (P<.05). The DM group had significantly less of each measured pro-survival Bcl-2 family proteins (Bcl-xl, p-BAD, and p-Akt) compared to control (P<.01). DM-ex group had significantly greater Bcl-xl and p-Akt compared to DM group (P<.01). DM-ex also had significantly greater p-BAD compared to DM(P<.05). Caspase expression was significantly higher in DM group compared to control (P<.01). Caspase-3 expression was significantly higher in DM-ex group compared to control (P<.05) but was also significantly lower compared to DM group (P<.05). Based on these findings, the exercise intervention reduced diabetic-induced cardiac apoptosis by maintaining pro-survival proteins and minimizing caspase-3 expression and other upstream signaling pathways of apoptosis. The evidence coincides with previous studies that have observed reversal of functional and molecular cardiac abnormalities with exercise training. 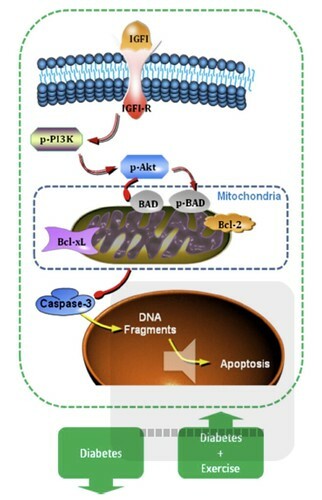 Phosphorylated Akt (p-Akt) is an upstream promotor of the Bcl-2 family of proteins within the mitochondria (Bcl-2, p-BAD, Bcl-xL) and the pro-survival pathway that prevents downstream signaling of apoptosis. BAD is a pro-apoptosis protein that leads to increased caspase-3 activation and subsequent nucleosomal fragmentation of DNA and execution of apoptosis. Exercise training increased the pro-survival protein activation and decreased the pro-apoptosis proteins within diabetic cardiac cells, leading to significantly reduced diabetic-induced apoptosis. 80 px diabetic rats were divided into four groups: control, exercise, exercise and extendin-4, and extendin-4 alone. Extendin-4 is a newly anti-diabetic drug that improves glucose homeostasis. The exercise intervention used in this study was treadmill running with a 15 degree incline for 30 minutes at a speed of 20m/min, 5 days a week. The intervention period was 8 weeks. IRS2 expression and apoptosis was measured in pancreatic beta islet cells before and after the intervention period using islet morphometry. Islet cell IRS2 expression significantly improved in extendin-4 and exercise groups, indicating improved insulin signaling. Beta islet cell apoptosis was significantly reduced in both extendin-4 and exercise groups. There were no differences between the extendin-4 group, exercise group, or the concomitant group. Both extendin-4 and exercise were found to improve pancreatic function and mass through IRS pathways, subsequently preventing cell hypertrophy and reducing apoptosis. This evidence coincides with previous studies that found exercise to be effective in improving IRS pathway signaling and beta islet cell survival. 20 5-week old mice with diabetes db/db and wild type matches were randomly assigned moderate exercise (ex) and sedentary groups to examine the effects on the apoptosis pathways in renal cells. Exercise consisted of motorized treadmill training at 5.2 m/min for 1 hour/day, 5 days a week for 7 weeks. Kidney weight, caspase activity, Bax and Bcl-2, ROS concentrations, and TNF-α were examined after the intervention and kidney dissection, using flourescent caspase-specific substrates, western blotting, and DHE staining on the dissected kidneys. Kidney weight was significantly lower in db/db+ex compared to their sedentary controls, indicating a reduction in renal hypertrophy. Caspase-3, caspase-8, and TNF-α were significantly reduced in db/db+ex compared to their sedentary controls. There was no difference in bax/Bcl-2 ratio or caspase-9 in db/db+ex and db/db mice. Both WT and db/db had higher renal ROS generation than their exercise counterparts. The authors conclude that the reduction in renal hypertrophy and oxidative stress in db/db mice with the exercise intervention correspond to previous studies examining the effects of moderate exercise on kidney function and morphology. Caspase-3, caspase-8, and TNF-α were also reduced with exercise in db/db, suggesting a reduction in receptor-mediated apoptosis. Because there was no difference in Bax/bcl-2 ratio or caspase-9 between db/db+ex and db/db, the authors conclude that the findings suggest that the intervention did not directly influence the intrinsic apoptosis pathways within the mitochondria. These studies each provide evidence that exercise can significantly reduce apoptosis in a variety of bodily tissues affected by diabetic pathology. However, the substrates affected by exercise in the apoptosis pathways may differ by tissue type. Further research is needed to clarify which pathways are affected by exercise in each tissue with diabetic changes as well as what parameters of exercise have the greatest effect on these respective tissues. In a review of insulin use on both type 1 and type 2 diabetes, Kourtoglou found that blood glucose levels must be monitored when combining insulin use and exercise. Due to an increase in glucose use in the muscles and the possibility of increased insulin levels, exercise can cause a decrease in blood glucose that can reach a hypoglycemic state. It is suggested that exercise intensity be slowly increased and blood glucose be monitored with subjects with diabetes in order to determine the response to exercise and develop the ideal timing for insulin injections, exercise, and eating. A study by Cunha et al. investigated the effects of a single bout of high intensity exercise to exhaustion on a control group of 10 healthy subjects, 10 subjects with type 2 diabetes taking metformin, and 10 subjects with type 2 diabetes taking glyburide (a drug in the Sulfonylureas family). The study measured cardiovascular, hormonal and metabolic effects of exercise to exhaustion. All subjects ate a standardized breakfast and took the appropriate medication at 30 minutes before eating with metformin and with their meal for glyburide. The results found that cardiovascular results had no significant change, plasma glucose and glucagon were higher, and insulin was lower in the diabetic groups compared to the control group. However, there was no change in plasma glucose for any of the three groups. For each group, no change was found for free fatty acid or nor-epinephrine levels. These results suggest that exercise to exhaustion does not have a significant effect for patients taking glyburide or metformin. Evidence suggests that mediators of inflammation, such as TNF-α, may be pathogenic because they cause vascular dysfunction. TNF-α plays an important part in monitoring vascular function. It binds to, and therefore functions through, its receptors TNF receptor 1 (TNFR1) and TNF receptor 2 (TNFR2). Dietary supplements and exercise have been found to be effective adjunct therapies that target endothelial dysfunction and vascular wall inflammation. Researchers have studied the role of fish oil lipids in both the regulation of TNF-α expression and TNF-α-induced inflammation in vascular cells. Dietary supplementation with omega-3 has been found to improve endothelial function and reduce TNF- α levels in children of patients with type 2 diabetes. In addition, omega-3 fatty acids, which are found in fish oil, noticeably suppress the production of TNF-α by monocytes (a type of WBC which is a part of the innate immune system) in response to endotoxin (a toxin associated with some Gram-negative bacteria). Omega-3 fatty acids also significantly prevent both monocytes’ adhesion to endothelial cells and their migration across the endothelium. It has been proposed by research that the mechanism by which fish oil alters the ability of lymphocytes to bind to endothelial cells may be due to fish oil’s prevention of the expression of adhesion molecules caused by pro-inflammatory cytokines (such as TNF-α). Evidence indicates that dietary supplementation with fish oil prevents TNF-α production by human immune cells, such as monocytes or lymphocytes. Overall, evidence suggests that inhibition of inflammatory cell adhesion and migration caused by TNF-α may explain the protective effects of a diet rich in fish oil against vascular inflammation. Research has found that a high intake of fiber-rich carbohydrates may contribute to weight management and is also beneficial for decreasing the risk of developing type 2 diabetes. In a study that investigated the effects of prolonged feeding of a 3.5% P. ovata husk-supplemented diet (a fiber-rich diet) in obese Zucker diabetic rats, it was found that the diet prevented endothelial dysfunction and the development of hypertension in the diabetic rats. The diet also decreased body weight gain and hyperinsulinemia, restored plasma adiponectin (a protein hormone that regulates metabolic processes) concentration, and decreased TNF-α levels. Figure 8. Patients with type 2 diabetes should choose foods that are high in fiber, such as the foods pictured in the figure above. Resveratrol is a natural phytophenol (a natural antioxidant) that can be extracted from grape skins. It has been found to reduce endothelial apoptosis as a result of suppressing increases in caspase-3 and -7 activities in endothelial cells, which is caused by TNF-α. The protective effect of resveratrol has been found to be weakened by the suppression of glutathione peroxidase (protects the body from oxidative damage) and HO-1 (an essential enzyme in heme catabolism). This indicates that antioxidant systems likely play a role in the anti-apoptotic action of resveratrol. In addition, like fish oil, resvertrol has been found to inhibit monocyte adhesion to endothelial cells, which is stimulated by TNF-α. This process likely occurs via the suppression of NFκB (a protein complex that controls DNA transcription and is induced by TNF-α) activation and inflammatory gene expression. In type 2 diabetic mice, TNF-α expression in the aorta has been found to be significantly increased, coupled with weakened endothelium-dependent vasorelaxation. However, after chronic resveratrol treatment, the type 2 diabetic mice demonstrate enhanced endothelial function and decreased TNF-α expression. Overall, evidence has found that resveratrol protects against 1) endothelial apoptosis caused by TNF-α, 2) monocyte adhesion, 3) atherogenesis (thickening of the arterial walls), 4) and dysregulation of vasomotor function. In addition, resveratrol suppresses TNF-α concentration after the inflammatory response and regulates vascular TNF-α expression. In sum, dietary supplements and natural supplements reduce TNF-α levels and suppress TNF-α-promoted pathological changes. This results in overall vasoprotective benefits in the body. The American Diabetes Association recommends that individuals with type 2 diabetes incorporate 10 diabetes superfoods into their individualized diet plans. Although these items are recommended, individuals should not limit themselves to eating only these items for every meal. Aerobic Exercise Training Aerobic exercise should occur at least 3 days/week, with no more than 2 consecutive days. Although most clinical trials use a frequency of 3 days/week, guidelines typically recommend 5 days/week. Intensity should be at least moderate intensity, which is comparable to 40%-60% VO2 max. Brisk walking would be considered a moderate intensity exercise for most individuals with type 2 diabetes. Individuals with type 2 diabetes should engage in a minimum of 150 minutes/week of aerobic exercise. Individuals should exercise in sessions of at least 10 minutes in duration spread throughout the course of the week. Forms of aerobic exercise that focus on large muscle groups and result in sustained HR increases will be beneficial. It is recommended that the individual participate in a variety of exercise modes. Gradual progression of intensity and duration is advised in order to minimize the risk of injury. Resistance Exercise Training Resistance training should occur 2-3 days/week on non-consecutive days, along with regular aerobic exercise. Resistance training should be of moderate (50% of 1-RM) or vigorous (75%-80% of 1-RM) intensity. Each session should include 5-10 exercises that involve the major muscle groups (those in the upper body, lower body, and core) at minimum and involve 10-15 repetitions per set to near fatigue. With training, amount of weight can be progressed. Resistance training should incorporate both resistance machines and free weights. Slow progression of intensity, frequency, and duration of training sessions is recommended. Running at moderate intensity for 30-60 minutes/5 days a week over a 7-10-week period was found to decrease apoptosis in cardiac, pancreatic, and renal cells. Cycling at a moderate intensity, defined as 65% VO2 max, for 10 weeks increased insulin sensitivity, improved mitochondrial content, and decreased oxidative stress in patients with type 2 diabetes. A single bout of endurace training at 120% lactate threshold had increased PGC-1α compared to endurace training at 80% lactate threshold. Acute walking for 40 minutes at moderate intensity (70% VO2 max) did not significantly increase AMPK activity in patients with type 2 diabetes and obesity. However, AMPK activity did increase more than in the low intensity (50% VO2 max) group. A progressive aerobic exercise program of walking 5 days per week for 7 weeks significantly increased LKB1 activity (the activator of the AMPK pathway) in obese insulin-resistant rodents. Cycling at a moderate intensity, defined as 55% of a maximal workload, 30 minutes per session, twice per week for 12 weeks was found to increase IMCL levels and increase insulin sensitivity in patients with type 2 diabetes. Single bout of 70% VO2 max exericse increased PGC-1α in healthy subjects, obese subjects, and obese diabetic subjects. 7 weeks of endurance training showed increased PGC-1α in obese diabetic mice, compared to sedentary non diabetic obese and lean mice. Cycling at high intensity(90% max HR) for repeated short bouts(10x60sec) over a 2-week period was found to significantly increase in Glut4 in muscle cells and improve glycemic control. High Intensity Training consisting of 60 seconds of peak cycling with 75 seconds rest lasting for <30 minutes of total training had an increase in PGC-1α in the nucleus. Cycle ergometry at a continuous moderate intensity (60min at 55% Wmax) for 60 minutes, 3 days a week and intermittent high intensity (6x5min at 70% Wmax) for 30 minutes, 2 days a week over a 4-week period was found to significantly improve Glut4 in muscle and adipose cells. There are several areas in which research is insufficient, unclear, or controversial. Therefore, further research would be beneficial. Further research is needed to determine the intensity and duration of exercise that is required for patients with obesity and type 2 diabetic to significantly increase AMPK activity. Also, to determine how a chronic exercise regimen would affect AMPK activity in subjects with obesity and type 2 diabetes. The exact mechanism behind decreased AMPK activity in patients with type 2 diabetes and obesity with exercise is unknown. Further research is also needed to determine if chronic training is more beneficial than acute training, or if the long-term cellular effects are similar. The evidence is currently unclear as to whether or not one is more advantageous than the other. Overall, the evidence overwhelmingly suggests that a combination of exercise and diet is most beneficial for individuals with type 2 diabetes from a cellular level. No study was found that reported any adverse effect of exercise alone or a diet and exercise combination in the subjects, whether the subjects were individuals with type 2 diabetes or healthy control subjects. It is important to note that exercise-induced hypoglycemia is a potential adverse effect in individuals with type 2 diabetes, although it is a rare occurrence. 1. American College of Sports Medicine and American Diabetes Association. Exercise and type 2 diabetes: American College of Sports Medicine and the American Diabetes Association: Joint position statement. Med Sci Sports Exerc. 2010; 42(12):2282-2303. 2. Diabetes mellitus type 2. The free encyclopedia Web site. Available at: http://en.wikipedia.org/wiki/Diabetes_mellitus_type_2. Accessed February 29, 2012. 3. National diabetes fact sheet: national estimates and general information on diabetes and prediabetes in the United States, 2011. Available at: http://diabetes.niddk.nih.gov/DM/PUBS/statistics/#fast. Updated 2011. Accessed on February 29, 2012. 4. Prediabetes. Mayo Clinic Web site. Available at: http://www.mayoclinic.com/health/prediabetes/DS00624. Accessed on February 29, 2012. 5. Orozco LJ, Buchleitner AM, Gimenez-Perez G, Roque I Figuls M, Richter B, Mauricio D. Exercise or exercise and diet for preventing type 2 diabetes. Cochrane Database Syst Rev. 2008;3:CD003054. 6. Hu G, Lakka TA, Kilpelainen TO, Tuomilehto J. Epidemiological studies of exercise in diabetes prevention. Appl Physiol Nutr Metab. 2007;32(3):583-595. 7. Sanz C, Gautier JF, Hanaire H. Physical exercise for the prevention and treatment of type 2 diabetes. Diabetes Metab. 2010;36(5): 346-351. 8. Gillies CL, Abrams KR, Lambert PC, Cooper NJ, Sutton AJ, et al. Pharmacological and lifestyle interventions to prevent or delay type 2 diabetes in people with impaired glucose tolerance: systematic review and meta-analysis. BMJ. 2007;334:299. 9. Gill JM, Cooper AR. Physical activity and prevention of type 2 diabetes. Sports Med. 2008;38(10):807-824. 10. Jeon CY, Lokken RP, Hu FB, van Dam RM. Physical activity of moderate intensity and risk of type 2 diabetes: a systematic review. Diabetes Care. 2007;30(3):744-752. 11. Hayes C, Kriska A. Role of physical activity in diabetes management and prevention. J Am Diet Assoc. 2008;108(4S1):S19-S23. 12. Crandall JP, Knowler WC, Kahn SE, Marrero D, Florez JC, et al. The prevention of type 2 diabetes. Nature Reviews Endocrinology. 2008;4:382-393. 13. Burr JF, Rown CP, Jamnik VK, Riddell MC. The role of physical activity in type 2 diabetes prevention: physiological and practical perspectives. Phys Sportsmed. 2010;38(1):72-82. 14. Laaksonen MA, Knekt P, Rissanen H, Harkanen T, Virtala E, et al. The relative importance of modifiable potential risk factors of type 2 diabetes: a meta-analysis of two cohorts. Eur J Epidemiol. 2010;25(2):115-124. 15. Morrato EH, Hill JO, Wyatt HR, Ghushchyan V, Sullican PW. Physical activity in U.S. adults with diabetes and at risk for developing diabetes, 2003. Diabetes Care. 2007;30:203-209. 16. Korkiakangas EE, Alahuhta MA, Laitinen JH. Barriers to regular exercise among adults at high risk or diagnosed with type 2 diabetes: a systematic review. Health Promot Int. 2009;24(4):416-427. 17. Ristow M, Zarse K, Oberbach A, et al. Antioxidants prevent health-promoting effects of physical exercise in humans. Proc Natl Acad Sci U S A. 2009; 106:8665-8670. 18. Hey-Mogensen M, Hojlund K, Vind BF, Wang L, Dela F, Beck-Nielsen H, et al. Effect of physical training on mitochondrial respiration and reactive oxygen species release in skeletal muscle in patients with obesity and type 2 diabetes. Diabetologia. 2010; 53:1976-1985. 19. de Lemos ET, Pinto R, Oliveira J, Garrido P, Sereno J, et al. Differential effects of acute (extenuating) and chronic (training) exercise on inflammation and oxidative stress status in an animal model of type 2 diabetes. Mediators of Inflammation. 2011;doi:10.115/2011/253061. 20. Meex RC, Schrauwen-Hinderling VB, Moonen-Kornips E, Schaart G, Mensink M, Phielix E, et al. Restoration of muscle mitochondria function and metabolic flexibility in type 2 diabetes by exercise training is paralleled by increased myocellular fat storage and improved insulin sensitivity. Diabetes. 2010; 59:572-580. 21. Yates T, Khunti K, Bull F, Forely T, Davies MJ. The role of physical activity in the management of impaired glucose tolerance: a systematic review. Diabetologia. 2007; 50:1116-1126. 22. Toledo FGS, Menshikova EV, Azuma K, Radikova Z, Kelley C, Ritov VB, et al. Mitochondrial capacity in skeletal muscle is not stimulated by weight loss despite increases in insulin action and decreases in intramyocellular lipid content. Diabetes. 2008; 57:987-994. 23. Boule NG, Weisnagel SJ, Lakka TA, et al. Effects of exercise training on glucose homeostasis: The HERITAGE family study. Diabetes Care. 2005; 28(1):108–14. and glucose tolerance in middle-aged people. J Appl Physiol. 1995; 78(1):17–22. 25. Boule NG, Haddad E, Kenny GP, Wells GA, Sigal RJ. Effects of exercise on glycemic control and body mass in type 2 diabetes mellitus: A meta-analysis of controlled clinical trials. JAMA. 2001;286(10):1218–27. 26. Haskell WL, Lee IM, Pate RR, et al. Physical activity and public health: Updated recommendation for adults from the American College of Sports Medicine and the American Heart Association. Med Sci Sports Exerc. 2007;39(8):1423–34. 27. Hu FB, Stampfer MJ, Solomon C, et al. Physical activity and risk for cardiovascular events in diabetic women. Ann Intern Med. 2001;134(2):96–105. 28. John L, Rao PS, Kanagasabapathy AS. Rate of progression of albuminuria in type II diabetes. Five-year prospective study from south India. Diabetes Care. 1994;17(8):888–90. 29. Dunstan DW, Daly RM, Owen N, et al. High-intensity resistance training improves glycemic control in older patients with type 2 diabetes. Diabetes Care. 2002;25(10):1729–36. 30. Albright A, Franz M, Hornsby G, et al. American College of Sports Medicine. 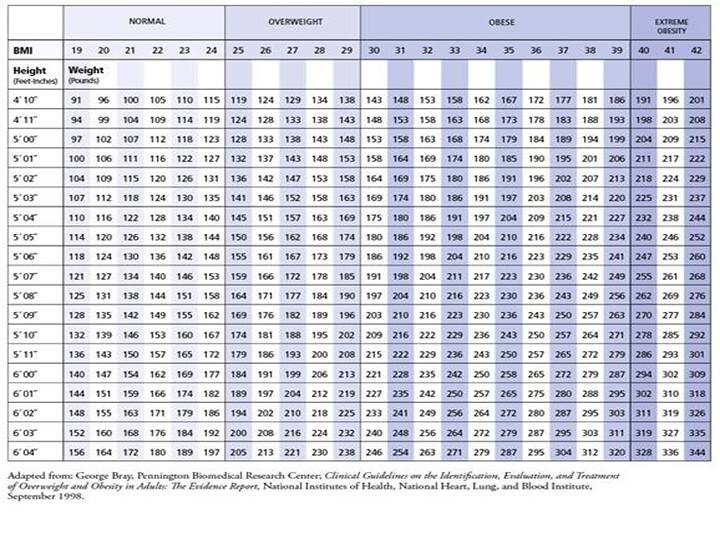 Position Stand: exercise and type 2 diabetes. Med Sci Sports Exerc. 2000;32(7):1345–60. 31. Gordon BA, Benson AC, Bird SR, Fraser SF. Resistance training improves metabolic health in type 2 diabetes: a systematic review. Diabetes Res Clin Pract. 2009;83(2):157–75. 32. Zhang H and Zhang C. Vasoprotection by dietary supplements and exercise: Role of TNf-α signaling. Exper Diabetes Res. 2012; E1-6. 33. Sattar N. Inflammation and endothelial dysfunction: intimate companions in the pathogenesis of vascular disease? Clinical Science. 2004; 106(5):443-445. 34. Zhang H, Park Y, Wu J, et al. Role of TNF-α in vascular dysfunction. Clinical Science. 2009. 116(3):219-230. 35. Tartaglia LA, Weber RF, Figari IS, Reynolds C, Palladino MA, Goeddel DV. The two different receptors for tumor necrosis factor mediate distinct cellular responses. Proceedings of the National Academy of Sciences of the United States of America. 1991. 88(20):9292-9296. 36. Rizza S, Tesauro M, Cardillo C, et al. Fish oil supplementation improves endothelial function in normoglycemic offspring of patients with type 2 diabetes. Atherosclerosis. 2009; 206(2):569-574. 37. Mayer K, Meyer S, Reinholz-Muhly M, et al. Short-time infusion of fish-oil based lipid emulsions, approved for parenteral nutrition, reduces monocyte proinflammatory cytokine generation and adhesive interaction with endothelium in humans. Journal of Immunology. 2003; 171(9):4837-4843. 38. Goua M, Mulgrew S, Frank J, Rees D, Sneddon AA, Wahle KWJ. Regulation of adhesion molecule expression in human endothelial and smooth muscle cells by omega-3 fatty acids and conjugated linoleic acids: Involvement of the transcription factor NF-κB. Prostaglandins Leukotrienes and Essential Fatty Acids. 2008; 78(1):33-43. 39. Wang TM, Chen CJ, Lee TS, et al. Docosahexaenoic acid attenuates VCAM-1 expression and NF-κB activation in TNF-α treated human aortic endothelial cells. Journal of Nutritional Biochemistry. 2011; 22(2):187-194. 40. James MJ, Gibson RA, Cleland LG. Dietary polyunsaturated fatty acids and inflammatory mediator production. American Journal of Clinical Nutrition. 2000; 71(1):343S-348S. 41. Galisteo M, Sanchez M, Vera R, et al. A diet supplemented with husks of Plantago ovate reduces the development of endothelial dysfunction, hypertension, and obesity by affecting adiponectin and TNF-α in Zucker rats. Journal of Nutrition. 2005; 135(10):2399-2404. 42. Ungvari Z, Orosz Z, Rivera A, et al. Resveratrol increases vascular oxidative stress resistance. American Journal of Physiology. 2007; 292(5):H2417-H2424. 43. Deng YH, Alex D, Huang HQ, et al. Inhibition of TNF-α mediated endothelial cell-monocyte cell adhesion and adhesion molecules expression by the resveratrol derivative, trans-3,5,4-trimethoxystilbene. Phytotherapy Research. 2011; 25(3):451-457. 44. Csiszar A, Smith K, Labinskyy N, Orosz Z, Rivera A, Ungvari Z. Resveratrol attenuates TNF-α induced activation of coronary arterial endothelial cells: Role of NF-κB inhibition. American Journal of Physiology. 2006; 291(4):H1694-H1699. 45. Zhang H, Zhang J, Ungvari Z, Zhang C. Resveratrol improves endothelial function: Role of TNFα and vascular oxidative stress. Arteriosclerosis, Thrombosis, and Vascular Biology. 2009; 29(8):1164-1171. 46. American Diabetes Association. Food and fitness: Diabetes superfoods. 2012. http://www.diabetes.org/food-and-fitness/food/what-can-i-eat/diabetes-superfoods.html. 47. Weight-Control Information Network http://www.google.com/imgres?hl=en&biw=1280&bih=685&gbv=2&tbm=isch&tbnid=5DS8fg35qZf9JM:&imgrefurl=http://win.niddk.nih.gov/publications/tools.htm&docid=9UBpsWVXsJZIMM&imgurl=http://win.niddk.nih.gov/publications/tools/bmi-chart.jpg&w=578&h=524&ei=_C9RT6zPKcXe0QGj99HJDQ&zoom=1&iact=rc&dur=463&sig=109882748999414666784&page=1&tbnh=148&tbnw=163&start=0&ndsp=18&ved=1t:429,r:11,s:0&tx=87&ty=82 Updated 2012, Accessed March 2, 2012. 57. Ghosh S et al. Moderate exercise attenuates caspase-3 activity, oxidative stress, and inhibites progression of diabetic renal disease in db/db mice. Am J Physiol Renal Physiol. 2009; 296:699-708. 63. Hussey SE, et al. Exercise increases skeletal muscle GLUT4 gene expression in patients with type 2 diabetes. Diabetes, Obesity and Metabolism. 2012; doi: 10.1111/j.1463-1326.2012.01585. 64. Little JP, et al. Low-volume high-intensity interval training reduces hyperglycemia and increases muscle mitochondrial capacity in patients with type 2 diabetes. J Appl Physiol. 2011; 111: 1554-1560. 65. Hussey SE, et al. Exercise training increases adipose tissue GLUT4 expression in patients with type 2 diabetes. Diabetes, Obesity and Metabolism. 2011; 13: 959-962. 66. Cheng S-M, et al. Exercise training enhances cardiac IGFI-R: PI3k: Akt and Bcl-2 family associated pro-survival pathways in streptozotocin-induced diabetic rats. 67. Park S, et al. Extendin-4 and exercise promotes β-cell function and mass through IRS2 induction in islets of diabetic rats. Life Sciences. 2008; 82: 503-511. 69. Zobra E, Cengiz T, Karacabev K: Exercise training improves body composition, blood lipid profile and serum insulin levels in obese children. J Sports Med Phys Fitness 664-669, 2011. 74. Ghosh S, et al. Moderate exercise attenuates caspase-3 activity, oxidative stress, and inhibits progression of renal disease in db/db mice. Am J of Appl Renal Physiol. 2009; 700-708. 76. Zanuso S, Jiminez A, Pugliese G, Corigliano G, Balducci S. Exercise for management of type 2 diabetes: a review of the evidence. Acta Diabetol. 2010;47:15-22. 77. Balducci S, Zanuso S, Fernando F, Fallucca F, Pugliese G, et al. Physical activity/exercise training in type 2 diabetes. The role of the Italian Diabetes and Exercise Study. Diabetes Metab Res Rev. 2009;25(S29-33). 78. Goodman C, Fuller K. Diabetes mellitus. Pathology implications for the physical therapist. 3rd ed. St. Louis, MO: Saunders Elsevier; 2009:488-497,1641-1643. 79. Snowling NJ, Hopkins WG. Effects of different modes of exercise training on glucose control and risk factors for complications in type 2 diabetic patients: a meta-analysis. Diabetes Care. 2006;29(11):2518-2527. 80. Umpierre D, Ribeiro PA, Kramer CK, Leitao CB, Zucatti ATN, et al. Physical activity advice only or structured exercise training and association with HbA1c levels in type 2 diabetes: a systematic review and meta-analysis. JAMA. 2011;305(17):1790-1799. 81. de Lemos ET, Nunes S, Teixeira F, Reis F. Regular physical exercise training assists in preventing type 2 diabetes development: focus on its antioxidant and anti-inflammatory properties. Cardiovascular Diabetology. 2011;10(12). 82. de Lemos ET, Reis F, Baptista S, Pinto R, Sepodes B, et al. Exercise training decreases proinflammatory profile in Zucker diabetic (type 2) fatty rats. Nutrition. 2009;25(3):330-339. 83. Kiraly MA, Bates HE, Kaniuk NA, Yue JT, Brumell JH, et al. Swim training prevents hyperglycemia in ZDF rats: mechanisms involved in the partial maintenance of beta-cell function. Am J Physiol Endocrinol Metab. 2008;294(2):271-283. 84. Laye MJ, Rector RS, Warner SO, Naples SP, Perretta GM, et al. Changes in visceral adipose tissue mitochondrial content with type 2 diabetes and daily voluntary wheel running in OLETF rats. Journal of Physiology. 2009;587(14):3729-3739. 85. Mikus CR, Rector RS, Arce-Esquivel AA, Libla JL, Booth FW, et al. Daily physical activity enhances reactivity to insulin in skeletal muscle arterioles of hyperphagic Otsuka Long-Evans Tokushima Fatty rats. J Appl Physiol. 2010;109:1203-1210. I like figure 3. That was a good find. I want to steal Figure 3 - it's perfect! I really like the section regarding the effects of exercise on medications for this patient population. I think this information is very important to understand when prescribing exercises. looks good, any chance you found anything that combines exercise and diet at the end to kind of tie it together? A lot of the "exercise" studies across the literature relate to exercise in combination with some form of diet, referred to as "lifestyle interventions". We comment on it it throughout the page, but studies on the sole effects of exercise and DM2 are limited. I think it is safe to say that exercise and diet will remain hand-in-hand as far as prevalence for the treatment of DM2. Thanks for the input though. We will look to clarify the findings between the two subjects. Awesome! My favorite read thus far. Great pictures that tie very well to the topics! I especially like the fish oil and dietary fiber section, didn't know they related so much to DM type 2! Good work! Great work! I think the diet and medications sections are nice additions to the page. I noticed that almost every section has a sentence or 2 summarizing your findings except a few…you might want to consider adding a short summary to those sections. Under Glut4, I would give a little intro sentence like you did under almost every other section so that I understand why it even matters if exercise impacts Glut4 in a patient with DM2. Also - I loved your intro, it provided me with a great overview of what I was about to read and made me want to keep reading! Your summary is great too - I would just play around with formatting under the "further research" and maybe make it numbered or bulleted like the "exercise recommendations based on cell biology"
I thought the apoptosis section was very interesting with the studies focusing on the heart, kidney and pancreas. All of the studies for AD look at the brain and muscle fibers, so it was beneficial to read about other organs and the impact of exercise on apoptosis. Also for this section, you may want to include an introductory sentence to the first paragraph before explaining the studies. In the "Exercise and Reduction of Type 2 Diabetes Risk" section, the last sentence in the first paragraph could flow better if you added something after "but not high enough to…". "qualify"? Also, in Table 2, Superfoods- there is a typo for "milk". Thanks for the feedback Susie. I will change that in the risk reduction section. I really liked how you wrapped up the page with exercise recommendations from cell bio, areas for further research and the conclusion. I really like that organization. Just one note, some of your paragraphs don't have spaces between them and some do. I think this should be consistent. In the TNF-alpha section, you say that it decreased after exercise. I'm wondering did it truly decrease from baseline or did it just not significantly increase? In my research in CF I only found that high intensity intermittent exercise resulted in no increase in TNF-alpha from baseline. It'd be cool if exercise actually decreases resting levels! That's a good point about baseline levels. From my work on HbA1c, it appeared that baseline levels had a pretty big impact on the amount of change (usually reductions) that occurred with exercise. It seemed like individuals with better glucose control at baseline (e.g. <7%) had less reductions in HbA1c in comparison to those with poor glucose control (e.g. >7%). This could be interpreted in a couple ways though, leaving an important question unanswered. It could mean that people with poor glucose control at baseline may have greater benefits from exercise interventions. However, even small reductions in HbA1c for patients with DM2 and better baseline glucose control could be clinically important.